Monday August 24th 1896 I did the washing and put a batch of corn to dry with a little help from Charlie. Will and I went in town after dinner. I wanted to bid Lee good-bye before he started to Montana. Will went down to see Mr Stevens again about the place. Came home to do sewing work. 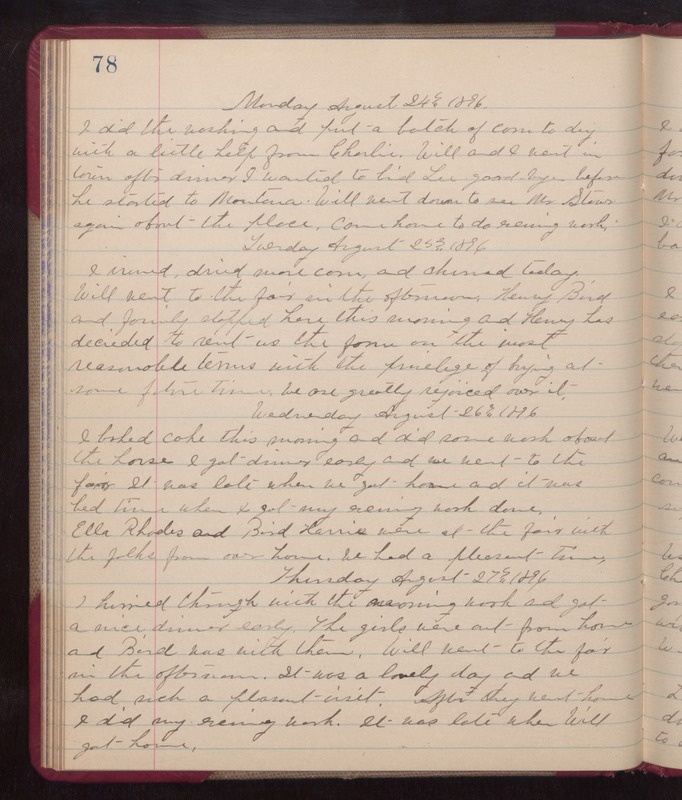 Tuesday August 25th 1896 I ironed, dried more corn, and churned today. Will went to the fair in the afternoon. Henry Bird and family stopped here this morning and Henry has decided to rent us the farm on the most reasonable terms with the privelege of buying at some future time. We are greatly rejoiced over it. Wednesday August 26th 1896 I baked cake this morning and did some work about the house. I got dinner early and we went to the fair. It was late when we got home and it was bed time when I got my evening work done. Ella Rhodes and Bird Harris were at the fair with the folks from over home. We had a pleasant time. Thursday August 27th 1896 I hurried through with the morning work and got a nice dinner early. The girls were out from home and Bird was with them. Will went to the fair in the afternoon. It was a lovely day and we had such a pleasant visit. After they went home I did my evening work. It was late when Will got home.